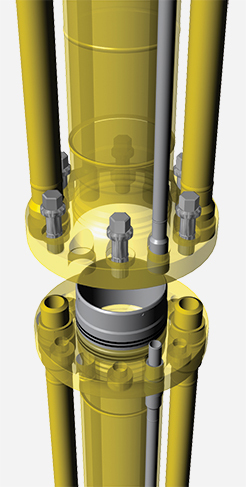 Dril-Quip's FRC™ Marine Drilling Riser Connector combines high coupling strength with ease of operations and meets the stringent durability requirements of today's deepwater drilling operations. Each connector features simple, reliable, trouble-free operation and fast, easy make-up characteristics. Special hydraulic wrenches ensure fast make-up and accurate preloading of the FRC Flange Connectors. This quick-running, high-strength coupling is designed for easy maintenance with field replacement of most of its components. This rugged, reliable riser connector delivers maximum uptime.